An inspiring true story of good intentions, unsung heroes, and unexpected results. 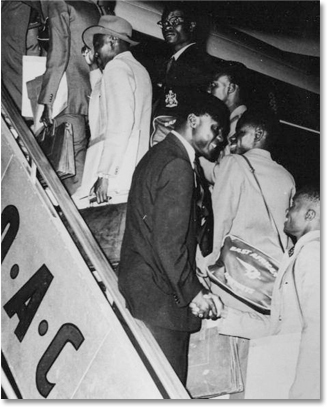 The book, Airlift to America, and this companion website, tell the long-hidden saga of how a handful of Americans and Kenyans fought the British colonial government, the U.S. State Department, and segregation to “airlift” to U.S. universities, between 1959 and 1963, nearly 800 young East African men and women who would go on to change the world. The students included Wangari Maathai, future Nobel Peace Prize laureate, as well as the nation-builders of post-colonial East Africa -- cabinet ministers, ambassadors, university chancellors, clinic and school founders. Scores of others, like Barack Obama Sr., future father of a U.S. president, were inspired by this grand project to come too, and received support from the airlift organizers once here. The book about these historic airlifts was written by Tom Shachtman with a Foreword by Harry Belafonte, was released in the fall of 2009. It is based on, and finally makes available to the public, the files of the airlifts sponsor, the African American Students Foundation, which had remained untouched for almost fifty years. This website, which is still in formation, will collect additional materials to supplement the book, including historical documents, photographs, and interviews. A blog will be included, for those who wish to share additional stories and recollections about the airlifts and their impact on the world. The airlifts to America were conceived by an unusual partnership of the charismatic, later-assassinated Kenyan Tom Mboya and William X. Scheinman, a young American entrepreneur and jazz aficionado. Jackie Robinson, Harry Belafonte, Sidney Poitier, and Martin Luther King, Jr. all played pivotal roles. The book telling the story of the airlifts is available for purchase from such sources as Amazon.com and Barnes and Noble, and can also be purchased on the websites of the Urban League and the AFL-CIO, where a percentage of the profits will go to those organizations.